Most people think that step sequencing exists solely to make hyper-quantised, dance-type music, but it's also an exceptionally fast way to build a song. If you're a songwriter, it can be easier to get a good rhythmic backup going with a step sequencer — you don't have to fiddle with setting up a MIDI keyboard, doing channel assignments, quantising your playing — and even to create bass parts and melody lines. But while you might enjoy the convenience of step sequencing, you might not be as thrilled with the lack of 'feel' in the parts. And even if you are using step sequencers for quantised music, you can add to their musicality with 'humanisation' techniques such as leading or lagging the snare drum, or altering velocities for more dynamics. In Sonar 8.5, Cakewalk added interesting humanising features to the Step Sequencer, so let's move 'off the grid' and take step sequencing into new sonic territory. The Step Sequencer view is another way of looking at a MIDI track (like Piano Roll view, for example). I often use the Step Sequencer with the Session Drummer 3 virtual instrument, so I select its associated MIDI track and go to View / Step Sequencer or type Alt-Shift-5. The Step Sequencer opens up, with rows for drum sounds and columns for entering notes at each step. Note that with Session Drummer 3 the drum sounds are already pre‑assigned to the drum sound rows. Now you need to set the number of beats in the sequencer (up to 64), and the number of beats per step (up to 16), using the toolbar. For beats in 4/4, try at least eight beats so that the first measure can be 'tension' and the second can be 'release'. I prefer 16 beats, to allow a small build‑up over the first two measures, and a meta‑build‑up over all four. Use four beats per step for 16th notes, but remember that changing the number of beats per step is a great way to create non‑4/4 time signatures. For me, step sequencing is the easiest way to experiment with time signatures like 5/4 and 7/4, for example, because of the obvious graphic differentiation of where the beats fall. If you click Play in the Step Sequencer's mini‑transport, nothing happens until you enter at least one note, whereupon Sonar creates a Step Sequencer clip in the selected MIDI track. The clip length equals that of the Step Sequencer's sequence. Here's how to combine the rigidity of step sequencing with the humanised feel possible with standard MIDI sequencing. Double‑clicking on the Step Sequencer clip brings up the Step Sequencer; logical enough. But if you right‑click on the clip and go to View / Piano Roll or View / Event List, you'll see these other views as well. Combining views enables powerful techniques. For example, although (as described later) the Step Sequencer allows shifting notes slightly before or after the grid — which can add expressiveness by 'leading' or 'lagging' particular drum hits — this is easier in Piano Roll view, particularly if a step sequence repeats multiple times, and there's a single Piano Roll sequence 'overdubbed' on the 'rolled out' step sequence. For example, use Step Sequencer for a rock‑solid kick and hi‑hat beat, while entering snare and tom hits in Piano Roll view, so you can shift their timing against the step sequencer. In the MIDI track, the yellow clip is the Step Sequencer clip (the Step Sequencer is toward the right). The black clips are notes added in Piano Roll view. Note that Track Layers is on, so you can see how the notes are distributed over multiple layers. Notes entered into the Step Sequencer appear automatically in the Piano Roll. Notes entered in the Piano Roll appear only in that view. You cannot select or edit Step Sequencer notes in the Piano Roll view; they are read‑only. However, notes entered into the Piano Roll view can be edited in that view. In the MIDI track, each note entered in the Piano Roll creates its own clip (turning on Track Layers for the track makes it easier to see all of these notes). Controller data added to either view will affect the notes in the other view, if the notes are assigned to the same channel. At some point you'll probably want to end up with a single MIDI clip, either Piano Roll or Step Sequencer, combining the notes from both views. You may prefer working with MIDI data in a Step Sequencer, the Piano Roll or a combination of the two, or perhaps create a beat in the Step Sequencer and fine‑tune it as a standard MIDI clip. Alternatively, you may create a MIDI clip (or import a MIDI file), then decide you'd rather work in the Step Sequencer. All of these options are possible. To convert a Step Sequencer clip into a MIDI clip, right‑click the Step Sequencer clip, then select 'Bounce to Clip(s)'. If you've created simultaneous Step Sequencer and Piano Roll clips, as described, selecting only the layers with the Piano Roll MIDI notes and going Edit / Bounce to Clip(s) combines all these notes into a standard MIDI clip and the Step Sequencer clip remains as is. However, selecting the Step Sequencer clip and Piano Roll view clip, then going to Edit / Bounce to Clip(s) combines all notes into a standard MIDI clip, and the Step Sequencer goes away. To convert a standard MIDI clip to a Step Sequencer clip, right‑click on the clip and select 'Convert MIDI Clip(s) to Step Sequencer'. By ticking the Preserve Original Timing box, any humanising timing offsets in a MIDI clip will be translated faithfully to the Step Sequencer. The last option requires a bit of elaboration, as it has a very cool feature. When you convert a MIDI clip to a Step Sequencer clip, you can choose a resolution (quarter, eighth, 16th, 32nd, or triplets for all values except quarter notes), which quantises the MIDI clip to the Step Sequencer steps. 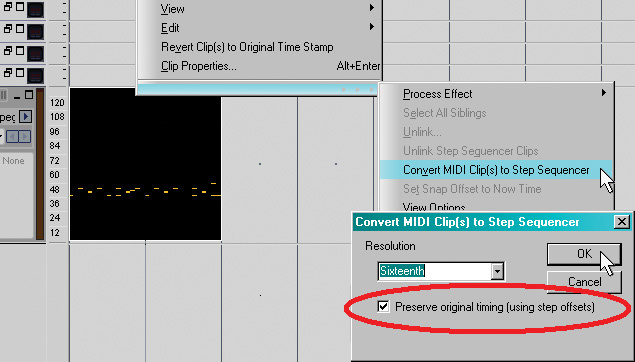 But if you have a 'humanised' MIDI clip with timing shifts, you can preserve these by ticking 'Preserve original timing (using step offsets)'. This adds editable offsets to the steps, although they still appear as standard Step Sequencer steps. Any offset is 'baked into' the Step Sequence step so, if you delete the hit in that step and then re‑enable it, the timing offset remains. If you change the sound for that row (by changing the note value to the right of the row name), the offsets remain intact, as they do if you copy the row with offset steps, create a new row, and paste those steps. This is helpful to preserve a groove. For example, say you want to reinforce a slightly humanised snare drum sound with a second snare sound. You probably want them to occur at the same time so that there's no flamming, and by using offset it's easy to do. There are also advanced timing-offset editing options. Imagine you want claps doubling the snare. Humans don't always clap at exactly the same time, so it's desirable to add slight timing differences if you want a more humanised sound. There are ways to deal with offset, all starting by clicking a track's Select button (the one to the left of the row's name). This opens a control panel with a Time +/‑ control to add a fixed amount of offset (affecting all events in the row). Positive values delay the event start times, while negative values advance them. The bars indicate how the timing of individual claps has been offset ahead or behind the beat. The red line (not present in Sonar, but added for clarity) shows the centre line of zero time offset. Another option is to select Time Offset as the MIDI Event Type of editing in the controller strip along the bottom of the row. Use the pencil tool to draw in the desired amount of offset; the centre line represents no offset, with bars above the line adding positive values and bars below the line adding negative ones (right‑click on a bar to return to a zero value). 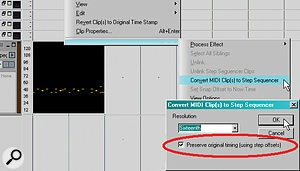 You can use these two timing options together, saving time with longer sequences. For example, for handclaps, instead of drawing in an offset for each clap, I'll typically add a constant amount of delay, but draw in a few offsets to add variations. If you want two rows with the same groove, Ctrl‑click the Select button for each row that you want to follow the offsets you're adding. The topmost row is where you do the actual editing. Make sure that Time Offset is selected for the controller strip, then draw the offsets you want. These same offsets will then be added to any other selected rows. While we're still in a row's control panel, set 'Step Play Probability' as the MIDI Event Type for editing. Now you can set the probability that a note will play, from 1 (never) to 100 (always, the default). The bars indicate the probability that a given note will play on its designated step. This may sound pointless — who wants notes to drop out unpredictably? — but it's useful for percussion. Double a percussion row with a similar, but different, sound at a lower level and adjust probabilities on the low‑level row so that sometimes these sounds double the main sound, and sometimes not. If done subtly, this adds great variation that you 'sense' rather than hear. Who says step sequencing has to be rigid?